These pressure relief valves are made to the cornelius standard and are compatible with cornelius type kegs. These are accurately made and batch tested for consistency. This important safety mechanism has been manufactured to tight specifications to ensure it's reliability. Please be aware that these pressure relief valves should be clean to work correctly. If dried up beer or sugar gets into the pressure relief valve then clean this out immediately as this can effect the safe working and opening pressures. 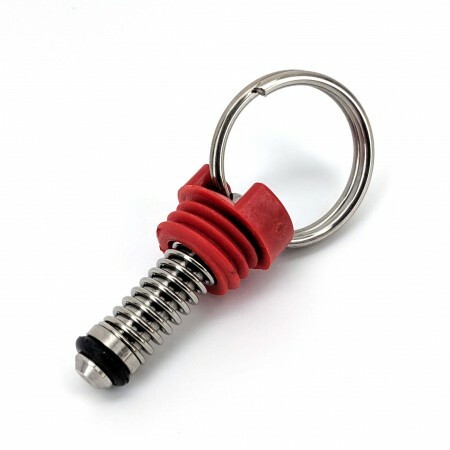 A replacement pull-ring style relief valve for your Corny Keg but they are compatible with other products such as the MK4 Regulator and Kegmenter lids. This is the most common relief valve on all ball lock kegs. If you do have a lever tab second hand ball lock keg, you can switch it out with one of these. All of KegLand Brand New Kegs come with a ring pull PRV like this. NOTE: This is a safety device designed to release pressure at the approximate rated pressure. THIS IS NOT TO BE USED AS SPUNDING VALVE. The pressure rating on these is approximate with tolerance of +/- 10psi. If you need accurate pressure control to hold residual pressure in a pressure fermenter or pressure vessel we would recommend using the BlowTie or alternatively you can get the whole BlowTie Kit.